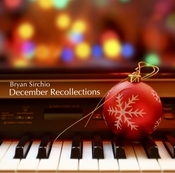 Original Instrumental Arrangements of Christmas songs on piano (Note: The "Buy Now" button with 2 Checkout for any item is for physical CDs that will be mailed to you immediately). Downloads are available next to each song title or on itunes. Be sure to check out the special "Christmas Package Deals" listed on the right margin of this page. Just select the icon and each offer will be described. If you have any questions about how to total your order and get the best quantity price please email me through this site or at bsirch@sirchio.com and I will get right back to you. The Steinway piano you'll see on the CD tray of this recording (or in the "gallery" section of my website) is the instrument on which I arranged and recorded these “December Recollections.” It came into my family’s life in about 1920, when my grandfather promised he would buy his rather shy bride a piano if she would enter a local vocal contest. She entered the contest and won first prize, and I grew up banging on this piano at my grandparent’s house. I then loved playing and composing on it at my mom's home for years, and then shortly before she died she had it rebuilt and sent it as a gift to me. Unfortunately it was damaged in the rebuilding process, and I was told it would never be “healthy” enough to use for recording. But I’ve had some work done on it bit by bit, and in October, 2015 realized it might just be worthy of some recording. I put some good mics on it and sure enough…it sounded great. I got inspired to mess around with some of the hymns of the Advent and Christmas season, and “December Recollections” spilled out in about a week. I’m delighted to share this piano and these simple arrangements with you. Hopefully these gentle renditions of some of the Advent and Christmas classics will be some nice background music as you go about your holiday traditions, or perhaps provide a musical framework for some quiet medition and reflection. I only wish my mother could hear this project... She didn't play herself, but always loved hearing that piano. Who knows, perhaps she's well aware of this project and other songs of mine that were written on this instrument such as "In God's Hands" and "The Nightingale and the Rose" on my Spring 2015 release "Fully Alive." Love you mom. Thanks so much for this beautiful piano.